Having a baby is an exciting, yet disruptive time in any family’s life. It involves significant adjustment for each family member. While this is a huge period of transition for mum and dad, it is essential to also consider how these changes impact on the other children too. Toddlers can be particularly sensitive to the newborn adjustment, having just lost their role as the baby in the family. This can unexpected an confusing for someone at such an ego-centric life stage, and can potentially result in some negative outcomes if not prepared for early. Things such as sleep or toilet training regression, tantrums and a possible return of infant-like behaviours as they struggle to maintain your undivided attention and adjust to becoming an older sibling. However, there are ways to prepare toddler for new baby arrivals. Depending on the age of your toddler, they should be able to gain some understanding of the situation through you talking to them. Explain early on that a new baby will be joining the family and give frequent reminders. Toddlers and older children are very visual so showing them images can help improve their understanding. Ultrasound scans, photographs of them as babies, images in magazines for example. Showing images in baby books such as What to Expect When You're Expecting is also a great way to explain the changes to your body, with images of pregnant women and baby development stages. This was a great method with my 2 year old to prepare for a newborn. There aren’t heaps of images, but they helped her start to understand the reason behind mummy’s big tummy. Find opportunities to have your toddler around other babies if you know anyone who has recently given birth or has an older baby. Point out babies in places like shops and play groups also, explaining that mummy has a baby in her tummy and it will be like those babies when it arrives soon. This takes away some of the fear of newborns if your toddler had previously not encountered many. If you are planning any big changes to your toddlers routine, try to do this at least a month before your due date. This means things such as transitioning to their own room or from a cot to a bed, weaning and even establishing a toilet training routine well before the baby’s arrival. This reduces the likelihood of your toddler associating change with the newborn, as it will be a big enough adjustment already. Build up the excitement of the baby to prepare your toddler by creating a positive anticipation. Help your toddler look forward to the change through the use of positive communication. Toddlers read a lot about a situation from your reactions so this will help reduce the anxiety they may otherwise feel. It is essential to continue considering ways to prepare a toddler for a newborn even after the baby’s arrival. This means ensuring both parents spend quality one on one time with the toddler each day, to reinforce the fact they are equally important and loved. This is a great time to do the toddlers favourite activities such as reading books or playing blocks. You can also try and incorporate some of these activities while you breastfeed or bottle feed the newborn, ensuring your toddler still feels they have your attention even when busy with the baby. Giving your toddler special big kid tasks can also be a great method, asking them to help you do baby tasks such as nappy changes by handing you a clean nappy or powder, or singing to their new sibling. Be sure to use lots of praise so they enjoy their new older sibling role. 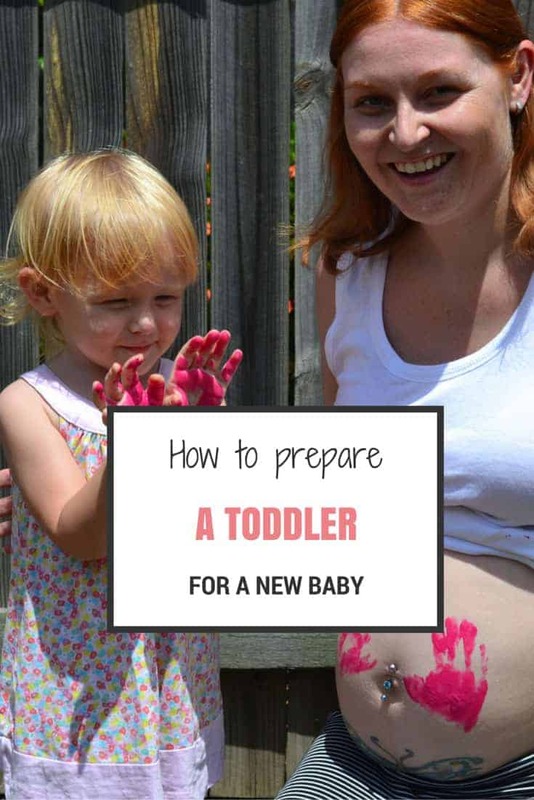 Putting these tips into place through pregnancy and beyond will help prepare toddler for new baby and make the transition much easier for the whole family. That’s not to say there won’t still be some toddler tantrums and behavioural changes, but this will hopefully make them much less frequent and more bareable. After all, adjusting to life with a newborn is crazy enough already without throwing terrible twos and threes in the mix. And don’t forget to check out my tips for saving money when expecting a new baby. Were there any special tricks and techniques that helped you bring a newborn into the home without drama? I’m planning on getting bub her own special baby doll once we have another so she can do things with her baby while I’m doing things with the real baby so she feels involved. It must be so hard for them to have to all of a sudden share attention when they’re used to be the centre of the universe essentially. Definitely. I’m still expecting some little upsets here and there but I think we will be mostly ok. We have a very kind hearted little girl, minus the usual no sharing and bossiness the age seems to come with haha the baby doll helps. Lily loves looking after her babies. Sounds like you are very well prepared! Both of my girls were a little older than your daughter (aged 4 and aged 5) when they became big sisters for the first time so they were great little helpers for me! I made sure I involved them as much as possible when preparing for baby and also after baby arrived. I bought my eldest daughter that book ‘There’s a House Inside My Mummy’ which was great to read before baby arrived, then we also got another called ‘I’m a Big Sister Now’ once baby was born. Sounds like you were well prepared yourself getting the girls ready. Older kids are certainly a little more helpful than a 2.5 year old will likely be haha but I have a friend who has already had her 3rd with our firsts being a couple of weeks apart. 3 under 3… Omg! No experience with a second but getting the toddler to play role of big sibling makes sense. I’ve heard that giving a gift from the baby to the sibling can be useful with the change too. I can’t share any tips or tricks because we haven’t experienced that and I think that my son will likely be a pre-schooler by the time #2 comes. But, the way I see him interact with friends babies and our nephew, I have no doubt he’d do really well. Thank you so much for following my blog! I am pleased to know you! Welcome!